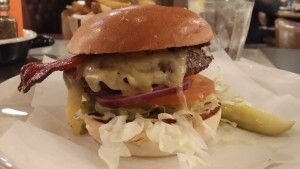 The ongoing quest for burger joy took me to Byron’s first Edinburgh branch, on the corner of North Bridge and the Royal Mile, today. You may have been part of the queue for their 25p burger day, a couple of weeks ago; it was certainly long enough. The main motivation for my visit was their greatly appreciated support of local charitable foundation One Feeds Two. Regular readers will recall that this was an endeavour spawned from the marvellous Elephant Juice Soup Co.
JP and Corrina Campbell developed the concept where businesses could partner with their foundation so that each time a meal was bought in a partner restaurant – from Byron to Cook to Steampunk to many others – the foundation would provide a meal for a child living in poverty. JP spoke at the first Scran Salon and told his inspirational story. No matter what you make of the rest of the review, go and support this fantastic project by giving Byron a try. But just because I admire their ethic, I still felt the need to consider Byron’s food on its on own merits, so down to business. 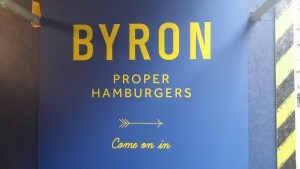 Here’s a question: does Byron’s strapline of “proper burgers” (with menu mention that their beef is “properly sourced”) mean that other places are “improper” in some way? It seems a rather odd binary to set up, particularly given there are many outlets in Edinburgh sourcing very good produce for very good burgers. Anyhoo, their service approach is…Well, upon entry I was met by a very talkative woman who told me a number of pieces of information that I already knew. Byron is opening a second branch on Lothian Road. They’re soon to open in Glasgow. You probably knew that, too. She seemed reluctant to choose where I should sit, so we went on a wander around the place, which is big, across split levels, and quite neatly decked out. It feels like a smart diner rather than another modishly appointed burger bar, which was a very welcome change from the current norm. Once seated I was bombarded by visits from overly friendly waiters asking me closed, positive-mood-inducing questions: “how has your day been…really good?” My answers were monosyllabic but they persisted nevertheless. It was the kind of non-listening, scripted service that I absolutely loathe. When the guy at the table next to me had the usual challenge of trying to shake the “proper” bottle of Heinz tomato ketchup just vigorously enough, a waiter intervened with “helpful” advice on how best to do it. Could we all not just be left alone to get on with things without constant nannyish inteventions? Chokingly overblown service aside, the food was actually pretty good. I opted for the Byron burger, which brought together a slightly under-seasoned burger with good bacon and enjoyable cheddar. Their special Byron sauce brought things together rather nicely. 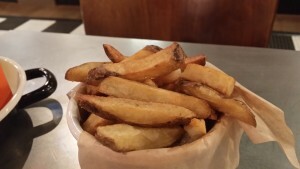 The skin-on fries were pretty good, too, once condiments had been applied. 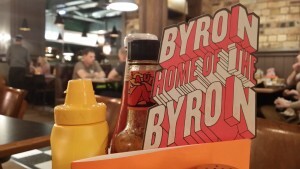 So overall, the message is go to Byron, support One Feeds Two, but prioritise their takeaway option as their approach to service is revoltingly interventionist, cloth-eared and script-forced. Totally agree about the staff, They were very nice but my goodness, they never left you alone! I like Byron, been to a few in London, but I have to say they are no competition for Bread Meets Bread who beats them in every way by a country mile!